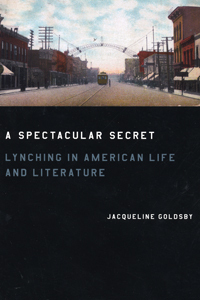 Jacqueline Goldsby, Associate Professor in English Language & Literature, received two honors last month for her 2006 book, A Spectacular Secret: Lynching in American Life and Literature. At the Modern Language Association’s convention last month in Chicago, Goldsby received the William Sanders Scarborough Prize, which is awarded annually for an outstanding scholarly study of black American literature or culture. Also, in December, Goldsby learned that the book was named a finalist for the American Studies Association’s Lora Romero First Book Prize. “It’s extremely gratifying to win this recognition from my peers in African-American literary and cultural studies,” said Goldsby of the Scarborough prize. Moreover, Goldsby added that the MLA’s award was particularly meaningful because it represents an important change in her field. “African-American literary criticism has a long and rich history,” she said, “but it wasn’t always acknowledged by institutions like the MLA. The Scarborough prize affirms the centrality of this field in American literary and cultural studies,” she said. Goldsby is only the sixth recipient of the prize, and Chicago’s first winner. Goldsby traces the origins of her book to her undergraduate years in the early 1980s at the University of California, Berkeley. While researching a bachelor’s honors thesis about racial violence’s effects on Southern family relations, Goldsby encountered the “missing history” of lynching in the United States. With little scholarship on the subject, Goldsby began to regard literature as a valuable, unmined repository of one of the darkest—and seemingly overlooked—periods in American history. As an American Studies graduate student at Yale University, Goldsby began to methodically examine the representation of lynching in American literature. The culmination of her research is a highly narrative work that charts the history of lynching from the 1880s to the lynching of Emmett Till in 1955. Like a literary detective, Goldsby uses several means to tell her story. But her method includes an important twist. “Instead of reading history into literary texts,” she said, “I read history out of them.” Starting with the scenes of mob violence as they are rendered in the literary works, A Spectacular Secret analyzes and reconstructs the mob murders and assaults that inspired the anti-lynching pamphlets of journalist Ida B. Wells-Barnett, the novels of Stephen Crane and James Weldon Johnson, and the poems of Gwendolyn Brooks. Telling the social and cultural histories this biographical evidence suggests, Goldsby returns to literary texts, arguing that their formal features register how the authors’ perceived the violence as a modern phenomenon. In recent years, there has been a groundswell of scholarly efforts to examine the history of lynching. But, A Spectacular Secret differs from those books, Goldsby said, because it turns to imaginative literature to tell a different but nonetheless “real” history of lynching. Later this quarter, Chronicle writer Josh Schonwald will interview Goldsby, who is on leave this year researching her latest work, Birth of the Cool: African American Literary Culture of the 1940s and 1950s. The interview will explore with Goldsby A Spectacular Secret: Lynching in American Life and Literature and Birth of the Cool, as well as the “Mapping the Stacks” project, which is documenting the African-American heritage of Chicago’s South Side.